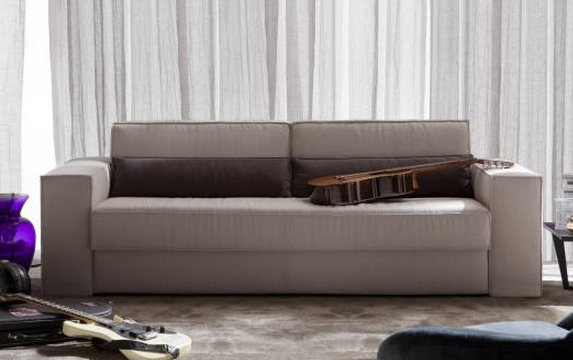 The Bella Lì is a sofa bed ready to rock. If you haven’t already seen our collection of sofa beds then you should know that Sofa bed Bella Lì changes from day to night in a single gesture, and, the seat and back cushions stay attached allowing for a quick and easy conversion without the clutter of cushions. This means you’ll still have room to dance. During the day, Bella Lì is contemporary with comfortable wide seat cushions and raised seams that emphasize the crisp shape, in addition there is a hidden and very practical container to store linen and bed pillows but this is only part of its charm. The guitars you see in the picture belong to our CEO Filippo Berto. Filippo is known among his friends as a wild rocker, who runs the business with verve and the spirit to dance the night away. In fact, the Bella Lì shares the same qualities as Filippo it rocks at night!